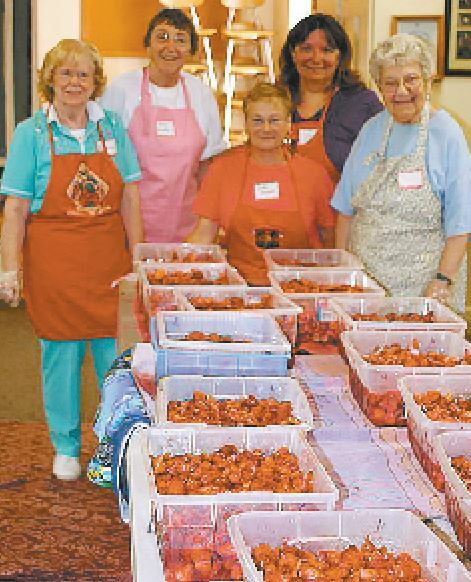 Shown are members of the Hollis Woman’s Club, including Doris Rafferty, Ginny Brooks, Lori Dwyer and Sema Miassian with several bins of strawberries as they prepare for the town’s annual Strawberry Festival. The event takes place from 2-4 p.m. on Sunday, June 25. HOLLIS – The Hollis Strawberry Festival and Band Concert will be held from 2-4 p.m. on Sunday, June 25 at Hollis Town Commons. The Hollis Town Band and the Hollis Woman’s Club provide the music and the food. The woman’s club role in this event starts, believe it or not, in January. The band director David Bailey prepares the donation request letters and members of the woman’s club stuff the envelopes and drop them off to the post office. Why do we do fundraising? The purpose is to raise the funds needed to cover the cost of the festival, as not all supplies are donated. Although the primary reason for the event is to celebrate the agriculture heritage of the Hollis and for the enjoyment of our community, the other reason is to support the scholarships and charitable giving of each nonprofit organization. In February, we also begin working on publicity, recruitment of subcommittee chairs, file for the event specific permit, Department of Transportation road closure, reserve the Hollis Brookline Middle School multipurpose room for inclement weather and reserve the town restrooms and town custodian for the event. There are some magazines with deadlines six-to-three months in advance of the event date. We begin to work in earnest in March to update our media distribution list and begin to create four articles to be submitted to the press. The Strawberry Festival Team meets in April to check on the status of recruitment, fundraising, determine how many quarts of strawberries to be ordered from Brookdale Fruit Farm and Lull Farm, and how many 3-gallon containers of vanilla ice cream to order from Doc Davis. We decide on the prices of the desserts, as well. At that time the subcommittee chair notebooks are handed out and the past year’s supply lists for the subcommittee chairs are updated and submitted to our stewards, who are in charge of securing the supplies, packing them into bins labeled with the subcommittee name and delivering them to the event site. updated and sent to The Copy Shop for printing. The appreciation poster is updated and sent to the Copy Shop to update the disc. The disc is taken to Big Graphics to produce the poster. The sign permit stickers are affixed to the signs and the signs are installed in 12 locations in town. The posters are given out to our member at the year-end event on the second Wednesday of May. Our members then install these posters in various places in town. 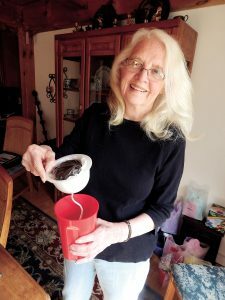 In late May and early June, four articles are sent to various media in the area, one for each week of the four weeks leading up to the festival. There is one more team meeting to confirm contents of subcommittee chairs’ bins and to go over rain procedures and any other issues that need to be resolved. In June, the Friday before the festival the strawberries are picked up and brought to Hardy Hall for cleaning, hulling, slicing and sugaring. The berries are then transported to Brookdale Fruit Farm for refrigeration. The baking team divides the supplies for the shortcake as the hulling is happening. Bakers pick up their supplies and drop off the short cakes on Sunday, the day of the festival. The day of the festival the berries are returned to Hardy Hall. The band and woman’s club subcommittee chairs begin setting up outside around noon. By 2 p.m. when the festival begins, we are ready and set to go. Members of the band and woman’s club cordially invite you all to join us for glorious band music and yummy strawberry desserts at the festival. The rain site is at the Hollis Brookline Middle School, 25 Main St., Hollis.